It is rooted in international development cooperation, in simpler terms often (wrongly) called aid. 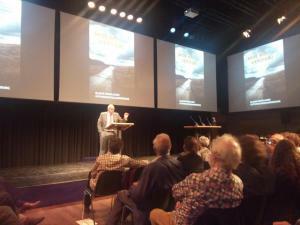 Yesterday evening, at a book launch about “65 years of Dutch development cooperation: where to next?”, Jan Pronk, the “moral compass” of Dutch development politics, offered a quick refresher on how international development cooperation came to be. After WWII, the global balance of powers had shifted dramatically: big changes had happened in politics, technology and economy. The international community concluded that the gap between those with power, and those without, had grown too big. International development cooperation was conceived as a counter-force, as a way to enhance the international legal order to safeguard the positions and rights of those with little or no power: people, companies, countries, cultures. The word “cooperation” was carefully chosen: it’s about working towards common goals, with shared values. It’s egalitarian, about agency of all stakeholders. In the last 65 years, international development cooperation had to adapt to changes brought about by globalisation. In today’s world, the internet and mobile technology together form a new infrastructure for globalisation. And “open”, the mindset of sharing resources (often digital: source code, data, designs, publications, knowledge), is spreading rapidly on this new infrastructure. New political and economic actors emerge, and global systemic changes occur: a new world order is forming. For me, Open Development is the international effort to make (digital) rights and responsibilities an integral part of that new world order: in the legal order and in how we plan and do things. Join us at Open Development Camp and join the effort! Posted in Conferences, Ideas, International development, Open for Change and tagged Jan Pronk, ODC14, Open Development Camp.